I am so excited to announce that I am a BIZ Ambassador. If I were to rate the top three chores I dislike to do the most, it would include laundry. It used to not bother me until I had so much to do. I remember thinking how does someone so small have so many dirty clothes. It’s not actually the whole washer to dryer thing, it’s putting it away. It’s such a chore. I am so glad that Noah will help me do laundry. He will transfer the clothes for me and help match socks and put his clothes away. He hasn’t quite mastered folding yet, but we are getting there. I like to wash bedding once a week, I feel like it helps keep it fresh and clean. If someone is sick, it gets rid of germs too. I love freshly washed sheets and blankets. Did you know if you don’t properly launder your sheets it can make them wear out faster? I know some single guys don’t wash their sheets nearly as much as women do. I tend to sweat when I sleep and so does Noah, it gets hot upstairs at night, even with a fan on. There’s so many different brands of laundry detergents out there. There’s in fact an entire aisle at the store. Not only are there different brands, but there are different types: powder, liquid and even little packs. I like the liquid. I am always confused about where the pack goes with a front load washer. I am not really a powder fan because it can get messy and again, where do you put it? Won’t it clog up the drawer? After that you have scents. You can customize your own scent of your clothes based on the detergent and fabric softener you use, if you use one. As a BIZ Ambassador, I had the opportunity to try out some BIZ Detergent. They sent some to my house and it was nice not to have to lug anything in from the store. I was curious as to see how it handles stains and dirty clothes. The first thing I did was smell it. Smell is important to me, and it smells great. It smells clean and not too overpowering. Of course, I had laundry to do so I did the first load. I always worry about over filling the washer with detergent. I am not sure if that’s a fear from seeing it on TV or it makes me think of the time my friend and I accidentally put dish soap in the dishwasher and it made a huge mess. 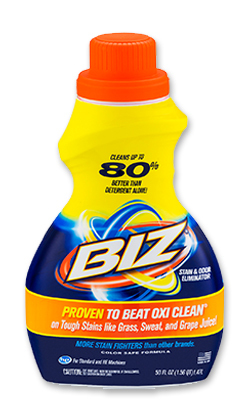 Either way, BIZ is safe for High Efficiency washers, it tells you on the bottle how much you should use depending on the type of the washer. The clothes came out clean and smelled good. I was really impressed; the colors were bright and clean. Noah does a lot of things at school. He loves art, so sometimes he comes home with paint on his clothes. I don’t know if they have smocks or not, like when I was in school. It wasn’t on his school supply list. He also loves to run and play at recess. He gets random stains on his clothes which makes me happy that BIZ does a great job at getting out for my family. As a BIZ Ambassador, I received complimentary product. All thoughts and opinions are my own.